I grew up in a very suburban environment, which while awesome for raising kids, was not always that interesting as far as activities were concerned. You can only stare out at the trees and imagine that you actually have neighbor friends for so long before you decide to go back to that Super Mario Brothers game because you are TOTALLY GOING TO BEAT BOWSER THIS TIME NOW THAT YOU'VE ALREADY DIED 75 TIMES. Since I spent so much time in our house due to lack of public transportation, I feel I remember many details very well that I pretty much have no business remembering. My parents no longer live in said house, so the number one odd childhood memory I have is from a giant burn mark from a pan that was placed on the wooden counter ONE TIME that was too hot and forever left its imprint. Although not really a huge deal in the long run (we owned the house, counter was wooden, it was more of an aesthetic turn for the worse), I will forever wonder why no one thought to use a trivet while placing the pan on the counter. 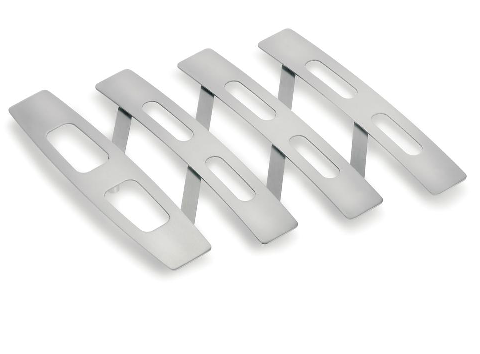 I came across this minimal-but-useful trivet while perusing for kitchen gadgets (a guilty pleasure, as you are all well aware my kitchen does not support many gadgets). When closed, it is merely 6" wide, yet can expand up to 17 3/4" for those larger pans or serving dishes. Especially in rental apartments, no one wants to do irreversible damage to a (possibly formica) counter that you will probably have to pay for with your security deposit upon vacating. Protect your countertop, use a trivet!